A young female Altmer follower and potential marriage partner. 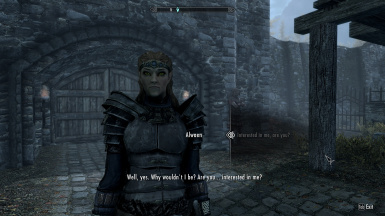 That's why I created Alwaen. 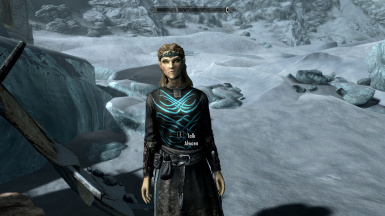 If you're out therer killing dragons and adventuring, she will wear anything you give her. If you dismiss or marry her, she will stay home (or at the starting place), wearing regular Tavern Clothes and a Steel Dagger. No full heavy armor or warpaint while relaxing. Not much. You can find her at The Bannered Mare an inn located in Whiterun. She will act as a regular vanilla folower, but I applied the Muffled Movement and Light Foot perks. She is essential, so she won't die. Alwaen will level up from level 10 to 50 and favors Destruction combat. 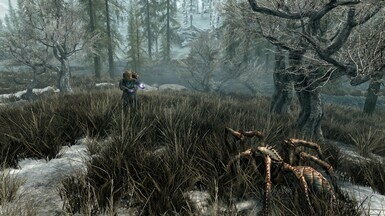 Also, this mod is compatible with Better Stealth AI for Followers and Follower Trap Safety.